We would like to invite you to participate in our brand-new, nationwide, luncheon series focusing on The Business of Cyber Risk: Quantifying and Managing Risk in Financial Terms. Hear from industry thought leaders as they present on how quantified cyber risk management programs are completely reshaping enterprise security operations. 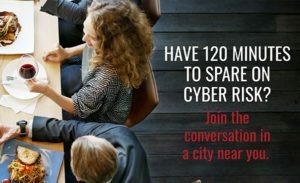 *120 Minutes on Cyber Risk is a regional lunch series geared towards individuals serving in a CISO or other high-level IT executive position. RiskLens reserves the right to review each registration and, at its own discretion, modify or cancel any registration deemed unsuitable for this event.